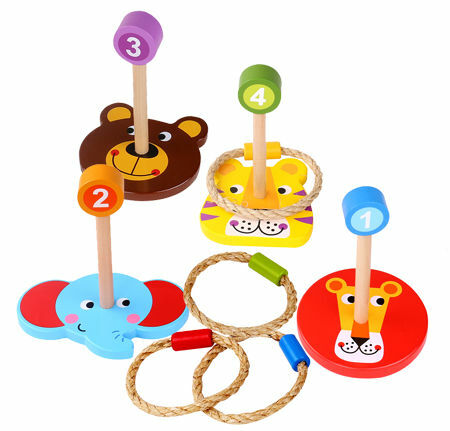 Ring Toss Animal Quoits Game is a colourful set of for uprights and four rope quoits. This traditional game has been given a lovely twist with a wooden tiger, lion, bear and elephant as the games uprights. The four rope rings have a colour collar so you can also try to get the ring over the matching colour upright. This lovely set comes in an attractive cardboard box. Materials: Wood with child-safe paint, rope. We like this because: "Great game. lovely colourful set."